Greater equality translates to economic vibrancy, and economic vibrancy leads to more equality, according to convincing new studies. In the past, many governments around the world have seen LGBT rights as a fringe issue. But now LGBT people are getting the world’s attention on core issues of life and death. 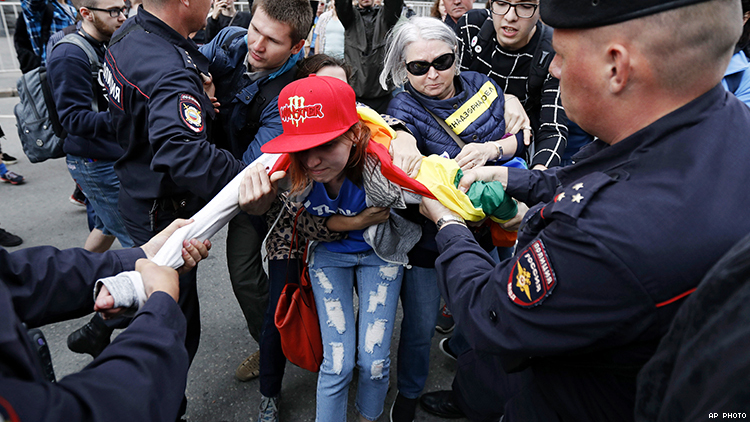 Whether it’s movement toward marriage equality in Taiwan (still uncertain) or the treatment of gay men in Chechnya (decidedly brutal), we can see both progress and reversals. New research shows why change has been so inconsistent and also highlights the shifting fate of LGBT people to the central challenges governments face around the world, such as improving their economies. Three recent studies that we co-authored looked at evolving levels of public acceptance of LGBT people, changes in legal protections, and economic performance in the world’s nations over the past few decades. Not only did we find strong connections between public acceptance and rights, but we also found additional evidence that rights and acceptance are connected to a country’s economic performance. All of these patterns point the way to more effective strategies for progress on LGBT rights. At the heart of the new studies is an index that combines information from public opinion surveys on LGBT issues for 141 countries. This index confirms the sense of polarization that we see in the headlines. In the past 15 years, countries that were more accepting, like Netherlands, Sweden, and Spain, have become even more accepting, and countries that were less tolerant, like Azerbaijan, Bangladesh, Ghana, and Georgia have become worse. Not surprisingly, we can see the effect of acceptance in the rights — or lack thereof — for LGBT people in different countries. Countries with people who are more accepting tend to have more welcoming legal environments. They are more likely to decriminalize homosexuality to start with. Then, as countries expand their legal protections for LGBT people, they follow one of several paths to reach legal equality and inclusion. They might also end discrimination in the military and ban discrimination in employment and public accommodations. Or they might start to allow LGBT people access to family rights in adoption and marriage. To translate growing acceptance into rights, though, the new research shows that countries need a working democracy. In addition, places with a free press and respect for the rule of law are most likely to be accepting and inclusive of LGBT people. For example, Taiwan’s LGBT people have both working for them, with a strong democracy and rising acceptance of LGBT people and rights. However, Chechnya, a part of Russia, is going in the wrong direction on both. Another powerful influence on LGBT people comes from the economy. Past research suggests that when countries grow stronger economies, people tend to feel more secure and more open to rights for LGBT people and other minorities. That effect is even stronger when economic gains are more evenly shared within an economy, so that everyone benefits. But the connections between LGBT rights and the economy are even stronger than that. Research from all over the world shows that LGBT people experience discrimination in employment and education, which will reduce their ability to contribute to the economy. Add to that the fact that stigma and violence damage the health of LGBT people, further diminishing their economic contributions. Taken as a whole, it’s easy to see how discrimination and violence against LGBT people can be bad for the economy. If poor treatment of LGBT people is bad for the economy, then we would expect to see countries that have a more accepting public and legal environment to have stronger economies — and that’s exactly what we find for 120 countries. A country’s average gross domestic product (GDP) is higher where acceptance of LGBT people is higher. How much? In the U.S., for example, it meant moving from our degree of acceptance in the early 1990s to public opinion in this decade. That kind of change is associated with a $1,500 increase in GDP per capita. Likewise, a supportive and inclusive legal environment for LGBT people is also related to higher GDP per capita. Adding one more legal right for LGBT people is associated with almost $1,700 more in GDP per capita. Putting the legal and public acceptance measures together shows that they reinforce each other: the relationship of acceptance is stronger when LGBT people have more rights, and vice versa. LGBT people need both in order to be fully included in the economy and society. Comparing this big picture economic view to acceptance and rights just gives us a correlation, of course. Adding a new right today will not boost a country’s GDP per capita by $1,700 tomorrow. But the underlying logic linking inclusion to economic performance makes sense from the perspective of the lived experience of LGBT people. Healthier, better educated, and employed LGBT people have more to offer than they can currently contribute. This research also points the way to powerful strategies for LGBT people. First, LGBT advocates should include efforts to promote democracy and press freedom as part of their agenda. Whether in Taiwan, Russia, or the U.S., a strong democracy is essential for translating more accepting opinions into policy change. Second, political leaders and LGBT advocates should include LGBT issues in discussions about economic policy. In the U.S. and European Union, businesses know that being able to attract and retain talented people, regardless of sexual orientation or gender identity, is essential for success. Some multinationals are putting that principle to work in other countries, too. The World Bank, the United Nations, USAID, and many other development agencies are studying this link and using this new argument to push for LGBT rights as part of an inclusive development strategy. Acceptance, democracy, legal rights, and economic improvement are parts of a strategy that will lead to better lives for LGBT people — and for everyone else, too. M. V. LEE BADGETT is a professor of economics at the University of Massachusetts, Amherst and a senior scholar at the Williams Institute. ANDREW FLORES is a political scientist at Mills College and a visiting scholar at the Williams Institute. ANDREW PARK is the former International Program Director at the Williams Institute.